Everyone who exercises experiences they're fumbles, flops and failures. Don't let them stop you! I won't fill your mind with dogmas. I am going to tell you about the stuff that really works! 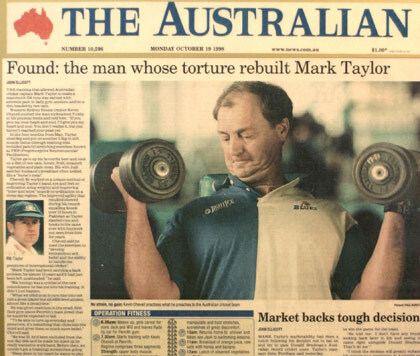 In 1992, at the completion of a long domestic and international season, I asked fellow New South Wales opening batsman, Steve Small, what he was going to do in the off season to keep fit. Steve said he was going to work out with a guy he knew at a gym in Penrith. That was the first time I heard of Kevin Chevell. For someone used to playing a bit of football in the winter to keep fit, the thought of a few leisurely sessions on an exercise bike seemed a good idea, so I tagged along. I'll never forget that first morning. Wow1 I ached for weeks. Since then, I've returned on many occasions to be put through the physical and mental wringer by Kev. He has pushed me to new limits and challenged me again and again to get the best out of myself. To prepare for the cricket field, you won't get anything harder than a workout with Kev. It's hard, damn hard. In Pakistan in 1998, I batted for 12 hours to make 334 runs in conditions renowned for being the toughest in the world. During my innings, there were several occasions when I felt tired. But, just when I was about to give it away I'd think to myself, "hang on, I don't feel as tired as I did when I was in the gym with Kev. I'm going to keep going." I'm no fitness freak. I've carried the nickname "Tubby" with me for years, and fitness has always been my weak spot. But I know if I can bat for two days in Pakistan, I can bat anywhere. Throughout my career, I'm proud to have shared a partnership with Kevin Chevell. The Chevell program works for me and it could work for you too. 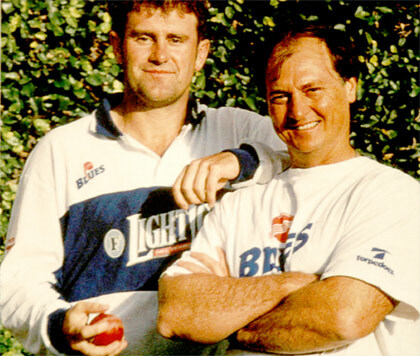 "Kev trained me so hard - pushed me - that I was happy when the international season started because it gave me a break from him, because his training sessions were designed to be much worse than anything I'd experience in a cricket game." "what kev taught me was that when you train hard you get stamina, you get strong and gain fitness - but the main benefit is the confidence it gives you." He believed the people who succeed consistently and at a sustained level in any field were those who believed in themselves, because they were the ones who kept it together when the world fell apart around them. That held me in good stead and I was lucky to get his messages in the early days of my career. And he became a trusted mate, someone I respected and someone I listened to, because when kev spoke I knew it was from the heart. "I feel that working with kev you not only get the best fitness trainer in the business you also get someone that know cricket and cricketers bodies. The strength and fitness gains are incredible, only wish id found him 15 years ago. Thanks big fella." "We have benefitted immensely from Kev's mentorship, knowledge of training, the game of cricket and his proven ability to bring out the best in athletes. I recommend your program to aspiring cricketers and I wish you continued success in the future." 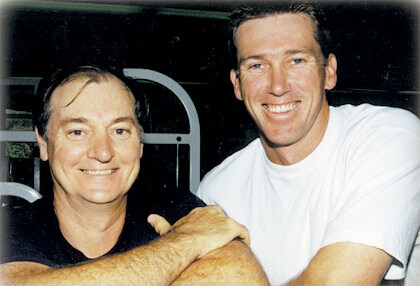 "Kevs training allows you to develop and grow in to a strong cricketer both mentally and physically. I believe his knowledge and experience is invaluable to any cricketer striving to be the best." "Kev has the ability to physically and mentally test yourself to reach new levels of fitness and strength. He does this through a collective force with his guidance and your teammates beside you to help each other out every step of the way. I can only anticipate great benefits and improvement for all players that are involved in the program for the upcoming season and can not thank Kev enough for the strength he has helped our players achieve in such a short period of time. Cheers,"
"I never thought I'd see Brad Taylor lift anything heavier than a cricket ball above his shoulders!! It has been an amazing program, hard work but great results. Thanks Kev"
"My sessions with Kevin have got me into the best physical shape I have ever been in, leading into a new cricket season. Kevins' program has not only built my physical strength and fitness, it has also developed my mental stength!" "I cannot put a value on how good Kevs program is !! I have come out mentally and physically stronger than I have ever been at any point of my life, and I would like to thank him for the work he puts into us, because I know we will all benefit from his program in the upcoming season with amazing results, I hope I don't see a rower for 6 months haha"
"I feel like i have gained more determination than anything else out of kevs program, like with those really tough sessions where we will do a 5 km row or a hell of a lot of squats that i can get through that. I feel like that will translate into a days cricket where its tough and we can't get many wickets i can come on and get the job done."